According to eMarketer, eCommerce sales continue to grow globally and will reach $1.9 trillion in 2016. Global retail eCommerce sales are expected to grow by 23.7% in 2016. In this post, we will take a look at 5 things: how to find international customers, turn your Shopify store multilingual, show local currency, create compliant invoices, and provide global shipping and tracking. One of the first challenges you may run into when expanding globally is finding your audience. It is only then that you can market to this audience. There are a number of factors that can help you determine where to go next. Proximity is typically one of the main factors that determines where to expand next. For example, U.S.-based stores might find it easier to start selling in Canada or Mexico due to familiar infrastructure and beneficial trade agreements. In the same way, stores in European countries may find it easier to expand to neighbouring countries. Look for markets where eCommerce is active and growing. For example, Asia-Pacific is the largest eCommerce market in the world. Expanding to such markets may be easier as your audience is online and is used to transacting online. You will have to make sure that your product is something that will resonate with the specific market you are targeting. Research blogs, forums, and other online platforms in your industry that are geared towards your target market. You can reach out to blogs and contribute on forums to showcase your products. This can help to get you some initial brand recognition. Having your store in the local language signals the effort you’ve put into selling and marketing to that region. Multilingual stores also attract customers as they are easily able to understand the content. The local language also helps index your store as it helps match your store’s content to what potential customers may be searching for in search engines. 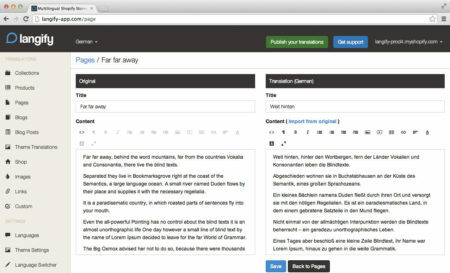 There are a number of translation services you can use to translate your store’s content – including pages, products details, meta tags, blog posts, etc. 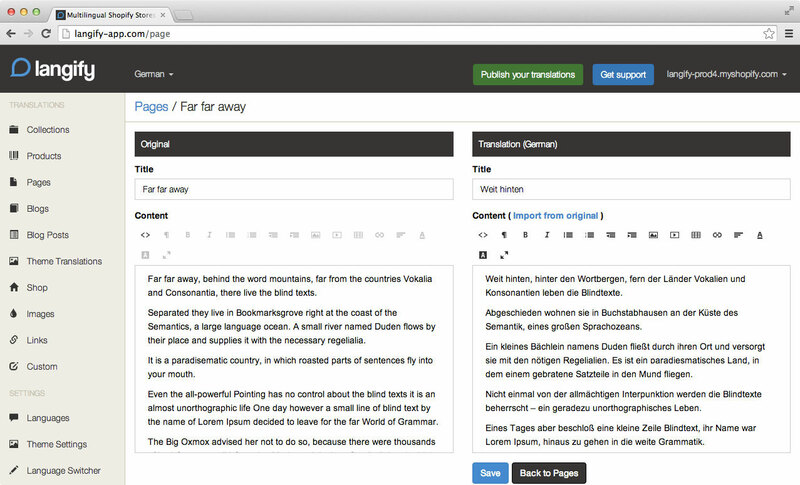 Once you have the translation, you can use apps like langify and Localize to implement multiple languages and language selectors on your store. Learn more about setting up multilingual stores in our previous post. Although Shopify does not allow customers to checkout and be charged in their local currency, you can display prices in local currency using apps like Currency Switcher. The app uses the current exchange rate to automatically switch the price display to local currency. When you display prices in local currency, you remove the step for customers to go off your store and manually check the price in local currency. In this way, customers remain on your store, which can lead to higher conversions. Many regions and jurisdictions around the world have different regulations around taxes and invoicing formats. You can automate your invoices and set up compliant templates using apps like Sufio. Sufio allows you to set up invoices in multiple languages and currencies, and provides templates that are compliant with accounting legislations in a number of different countries. You can highlight this on your store to incentivize customers to pick your store over competitors as customers have less hassle in accounting. Shipping costs can play a major factor in customer purchases and experience. If the shipping cost is not shown up front, and ends up being higher than customers expected, it can create a negative customer experience. On the other hand, if you end up absorbing the high cost, it can eat into your margins. In such cases, carrier-calculated shipping can help automatically set and display shipping costs to customers. You can use integrations from a number of different carriers on your Shopify store to enable this. In addition, you can use tracking services like AfterShip and Tracktor to keep customers updated about their order. eCommerce continues its growth globally with better technology available worldwide, and higher middle-class incomes. Global retail eCommerce sales are expected to grow more than 20% in 2016. This means that stores set up to do business internationally have an advantage as they can take part in this growth. There are a number of things you can do on your Shopify store to set it up for international selling. These include having the store translated for local markets, displaying prices in the local currency, customizing invoices to adhere to local regulations, and providing international shipping and tracking. You can use a number of Shopify apps to enable these on your store. What challenges do you face when selling internationally using Shopify? How did you manage through these challenges? Please share in the comments below.